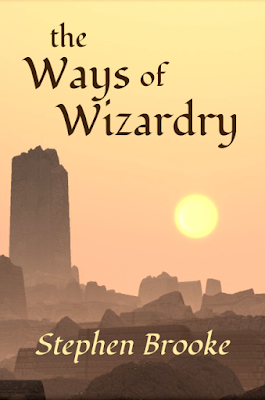 I’ve another good more-or-less finished draft of a novel ready, a somewhat typical ‘light’ fantasy to be titled THE WAYS OF WIZARDRY. This is the book I had no intention of writing, that I had had not added to my queue nor even never thought of. But it came out of me anyway, with less planning and outlining than usual. Oh, the outline did come; that is inevitable with the way I work. And I had a clear concept of my main protagonist from the start — the wizard Im has been referred to in other novels but never appeared before. And a young Im was the protagonist of my short story THE BOOK, THE BEAST, AND THE BURGLAR from which this novel grew (it is now the first chapter). A journey of discovery (I do that a bit! ), bordering on YA (Im is but 17 when the tale begins), with varied threats against our hero’s existence, his first love, hints of a darker future but ending on a high note — that’s pretty much the book. I was not that far into the process when I realized it was the first installment of a continuing story, an epic even. So expect sequels! Length was a fairly typical 60,000 words for this sort of book. Why I think in stories of that length, I’ve no idea. On going back through, I know that I am likely to add very slightly here and there, fleshing out places I might have rushed through a little. At most, the narrative might grow by a few hundred, maybe a thousand, words. That’s if the process goes as it normally does. It could be published as-is, really, but a little polishing never hurt. Nothing big; the story itself is solid. So we’ll get it ready and out the door at Arachis Press. Release date is set for January 6 next year. That’s plenty enough time (and it is a good idea to set myself deadlines). Before then, my poetry collection VOYAGES will be appearing, on Nov 1, 2017. And on to other projects!